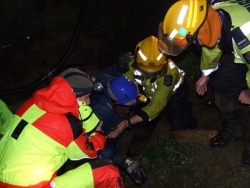 Seven members of the Cave Rescue team with most of the Police SAR squad, NZ Fire, & St. John Ambulance responded to Waipu Caves to rescue SIX teenage students from Northcote College along with TWO adults from a flooded cave resulting from rain deluge. This was originally a party of TWELVE with two instructors with only part of the group managing to exit before the flood waters came up blocking the exit. These EIGHT were underground since approx. 09:00 and had been trapped at approx. 14:00hrs. Cave entry by Northland SAR Cave Team was not obtained until approx. 18:30. Three members of the Cliff Rescue team (Shane Cleary, Glenn Hawke, & Kevin Bell)with Four members of the Police SAR squad responded rescued a 28 yr old German tourist, who was walking around the end of Tapeka Point near Russell in the BOI who got caught out with an incoming tide. Marine Coastal SAR Sept 2007 time waster. A full-scale air, sea and land search – costing around $10,000 – was mounted on Sunday in four-metre seas and 30 to 40-knot nor-easterly winds after family members thought two men and a woman were lost at sea after failing to return from a fishing trip. About 60 members of the Northland Land Search and Rescue squad, including police officers and civilian volunteers, were at Bland Bay on an annual training exercise when the alarm was raised over the trio about 9.30am on Sunday. Two search teams in the area – some members being blown off their feet in the gusty winds – found the camping trio. An 81 year old male suffering dementia walked out of his rest home between 0600 and 0645 hours. Rest home staff had searched for him till about 0900 hours then called the police. 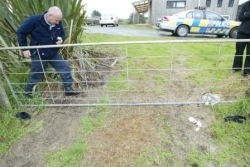 Local Waipu police and Highway patrol units searched for him on the roads till 1200 hours. Police and Northland SAR were then activated and searched on foot till 2030 hours. Intensive searching was continued for the next three days.